Tonight I want to leave you salivating for this delicious dish! Thanks to the food network for the recipe. Preheat the oven to 350 degrees F. Pulse the graham crackers in a food processor until crumbled. Add 1 to 2 tablespoons water and the butter; pulse until moistened. Wrap the outside of a 9-inch springform pan with foil to prevent leaks. Coat the inside of the pan with cooking spray and press the crumbs onto the bottom. Bake until browned, about 8 minutes. Let cool, about 10 minutes. Meanwhile, beat both cream cheeses and the sugar with a mixer on medium-high speed until smooth, 5 minutes, then beat in the sour cream on low. Lightly whisk the 3 egg whites in a bowl, then add to the cheese mixture along with the 2 whole eggs, flour, vanilla and lemon zest. Beat on medium speed until fluffy, 3 minutes. Pour over the crust. Place the cheesecake in a roasting pan and add enough warm water to come one-quarter of the way up the sides of the springform. Bake until the cake is set but the center still jiggles, about 1 hour 10 minutes. 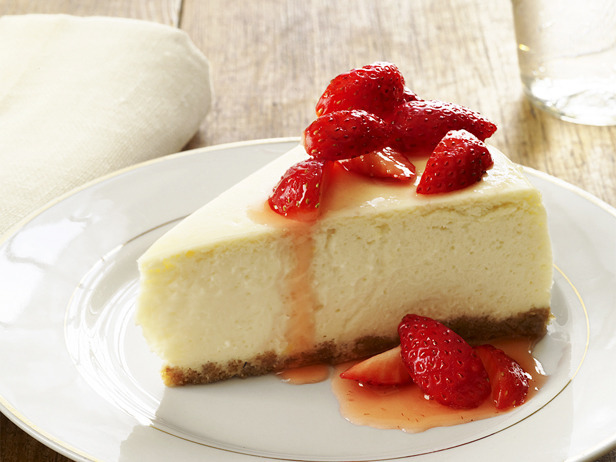 Turn off the oven; keep the cheesecake inside with the door closed for 20 minutes. Remove the cake from the water bath and transfer to a rack. Run a knife around the edge, then cool completely. Chill until firm, at least 8 hours. Top as desired.